There are a plethora of female blues singers these days and that is a very good thing indeed…these ladies are taking the blues into new areas and to new audiences that their male counterparts can only dream about. It’s not just about the voice however…the best of them are backed by superb musicians to reinforce their considerable vocal abilities. 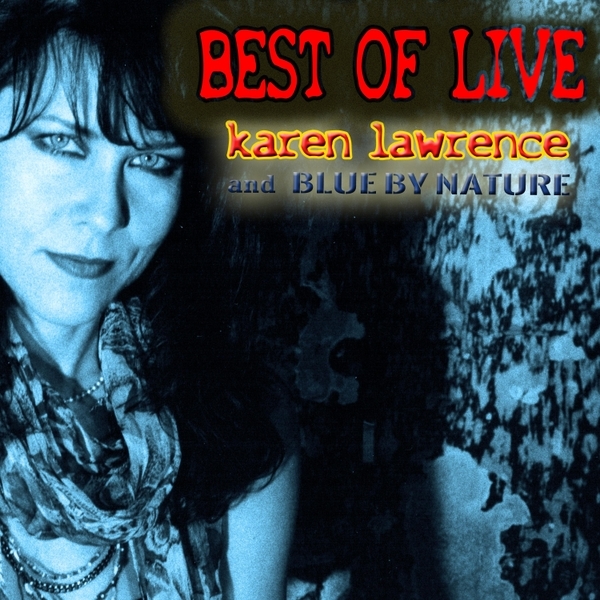 One such lady of the blues is the redoubtable Karen Lawrence, who has been performing since she was nine and, after being involved in various ‘new wave’ bands, she committed to her first love…the blues. As with the best, she has the advantage of some incredible musicians with the very apt name of Blue By Nature. She will inevitably draw comparisons with the usual suspects of Joplin, Turner and Bramlett, but she does have an identity of her own and that should be the mind-set when listening to her latest release, Best of Live. The rhythm guitarist, Fred Hostetler, selected the best tracks from the 1998 double CD ‘Live By The Lake, for a more digestible single CD and then re-mastered them to give them a cleaner, more vibrant sound. Opening with the love song, Fun And Games, Karen shows how to load the vocal with genuine emotion…and remember, this was recorded live. The band also shows their skill throughout with the twin guitar sound an absolute delight and this one will have you reaching for your lighter! Next up is the wah drenched and funk laden I Had It All Wrong. The guitar riff is great, with just a little hint of Sabbath before the true funk comes in with the vocal. The guitar solo is a great mix of bends, sustain and wah. Another Day, Another Mile is my favourite due to the purer blues feel and those guitars! It chugs along with typical blues enthusiasm and Karen’s vocal is suited and pitched perfectly for this song. You Got A Way About You is funk-ish with the strumming, but it develops into a soul-blues song of quality and has a stonking, if short, solo. I’ll Get Along Alright is blues of the type The Faces were so good at, but with a modern edge and more guitars…hence my total enjoyment. The vocal from Karen is also top drawer as she talks and sings with feeling. You’ve Got Me Workin’ is laced with superb slide over a simple but effective bass and drum pattern. It also fits in numerous time, tempo and tone changes, courtesy of the guys backing vocals…actually, I’ve changed my mind; this is my favourite. It’s Been So Long moves neatly into a lovely mix of styles, and a guitar sound that suggests Carlos Santana did a jam with this proficient band. The closing song, on my review copy at least, is the blues a la King, It’s All About You. It gives us a final taste of how consistent and strong Karen’s vocals are in this live setting and a reminder of the great guitar work we can expect. This collection is a good example of a band on top form dishing up the blues with precision…it is a thoroughly enjoyable compilation and the selected cuts are certainly well mixed and a distinct improvement on the first release. If you like blues played live, with nary a mistake and with feeling then this is a damn good place to go.